Developer Wulff Projects identified Roseneath Street as a prime space having previously developed within the Clifton Hill, Victoria area. The developers acknowledged 122 Roseneath, just 3 kilometres from Melbourne's CBD, as one of the last substantial development sites in the area; the site was acquired off-market in 2014. 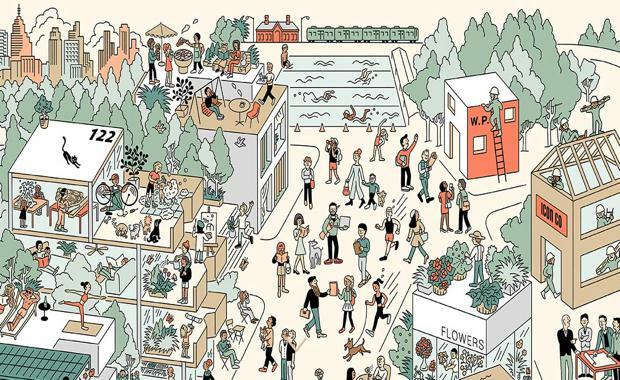 Where's Wally"-style website sets the tone for a five storey development with a beautiful, fresh, interesting, community-design focus with amenities to match busy inner-city buyers. Wulff Projects is a property development company forging a distinct model of development in an often standardised industry. It’s in our process that we establish strong foundations – a focus on proactivity, consultation and collaboration is key from project outset. It’s also what allows us to deliver both strong financial and social returns on investment. By building great environments in which to live, we create sustainable investment outcomes. Wulff Projects brings with us a trusted network of collaborators including consultants, contractors, and financiers who remain engaged through concept, planning, design, sales and build stages to beyond delivery. By involving all major contributors from project infancy we have seen innovative development solutions emerge. Icon is a leading Australian construction and development business with more than 17 years’ experience. Our major new partnership with Kajima – one of Japan’s largest and most respected construction companies – paves the way for further innovation and growth. Assemble is a Melbourne-based residential property developer focused on small footprint projects. We work with like-minded developers to share and realise our vision for sustainable cities. Our values and ideas find a voice in our publication, Assemble Papers — an online and biannual print journal about the culture of living closer together.